HeyOrca makes managing multiple clients simple - each client has their own separate content calendar and asset library. 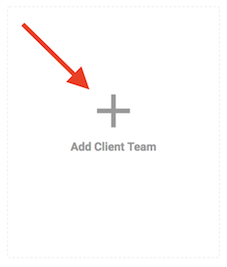 To create a new client team, select the “Add Client Team” tile on your dashboard. In the new team settings, give your team a name, select your client’s time zone, and upload a logo. Then connect the appropriate social channels. To connect a social media account, click on the social channel you want to connect and follow the prompts. Invite your internal team members to work on your new client team, and add external members for review. Make sure you click "Create Your Team" at the bottom of the page to have your new team added to the home screen!